Gustav Landauer was one of Germany’s most prominent, influential, and intriguing anarchist intellectuals and organizers. His critique of Marxist doctrine was more sophisticated than that of many of his peers, and his focus on the revolution’s “subjective forces” (in short: to change society means to change yourself) is more relevant than ever in the highly individualized world we live in today. PM Press has documented Landauer’s life and work in Revolution and Other Writings, the most comprehensive Landauer reader in English. Landauer was an active participant in the Bavarian Council Republic, an attempt to establish a radical council-based administration in Southern Germany. When reactionary soldiers, sent by Germany’s central Social Democratic government, crushed the republic, Landauer paid the ultimate price. He was lynched by a mob of soldiers on May 2, 1919. 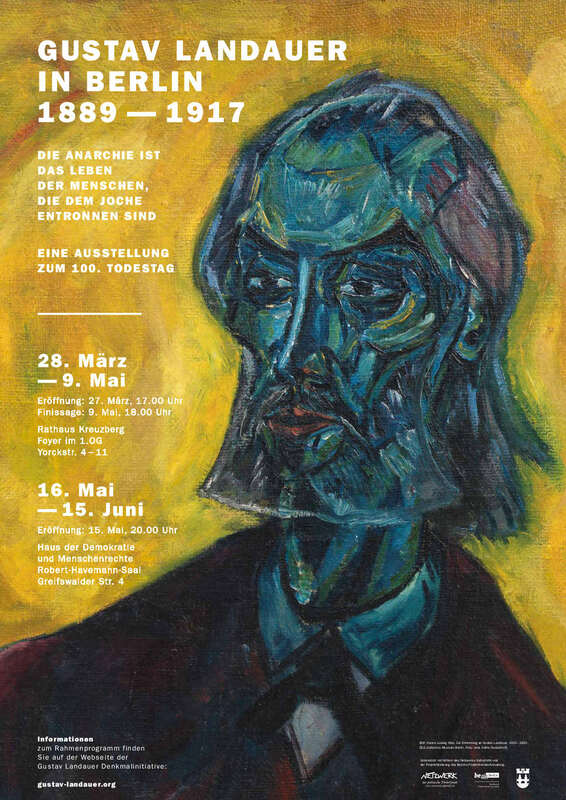 With the 100th anniversary of Landauer’s death approaching, the tireless folks of the Gustav Landauer Denkmalinitiative, portrayed on this blog before, have curated an exhibition about Gustav Landauer in Berlin-Kreuzberg. It opened on March 27 and can be viewed until May 9. From May 16 to June 15, it will also be shown at the Haus der Demokratie und Menschenrechte in Berlin-Prenzlauer Berg. The exhibition includes rare photographs and previously unreleased documents. It is accompanied by numerous lectures, panel discussions, and guided tours (Landauer lived in Berlin for several years). The entire program can be found here.